iOS 10 has turned your iPhone’s screen into a new hub for widgets—just swipe left on the lock page or home screen to check it out. But what even are widgets? Just think of them as app extensions or glances that offer you quick, digestible information without you having to actually open a single app. You can even see your widgets without unlocking your iPhone, making it either really convenient or potentially invasive. Widgets are perfect for checking the weather, your calendar, and the battery percentages on your connected devices. But widgets are also great for performing common tasks with as few taps as possible, like calling your best friend or Shazaming a song at a coffeeshop. The level of information and functionality varies, so you really have to try them out and see what works best for you. Here’s a few tips on how to get started with widgets in iOS 10. If you have an iPhone 6s, 6s Plus, 7, or 7 Plus, you can use 3D Touch to add new widgets offered by your installed apps. Just press down on the app icon to see the Widget module underneath or above the Quick Actions. From here, you can tap on the “Add Widget” on the top right. If your iPhone is not equipped with 3D Touch, you can add new widgets by going to your widgets page, scrolling all the way down, and tapping on “Edit.” On this screen, you can not only add new widgets but also remove existing ones and rearrange them. No two widgets are exactly alike—even the ones you’d think might be. For example, both Apple Maps and Google Maps have a widget for figuring out how long it will take you to get home, but the Google one lets you see your ETA via both a car and public transit. Some apps even have more than one companion Widget. Citymapper, for example, has three, depending on your various public transit needs. While widgets are mostly unique, some do conform to certain standards, especially the native Apple widgets. You’ll notice that Siri App Suggestions, News, and (Phone) Favorites all have a “Show More” option to expand. Furthermore, these widgets function simply as app launchers. 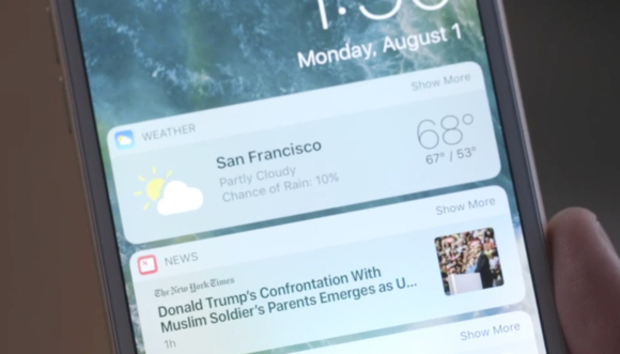 Meanwhile, widgets by third-party developers may tap into more interactive functionalities. Todoist, for example, will actually let you cross-off an item from your to-do list from inside its Widget without launching the main Todoist app. Widget discovery is not as easy as we’d like—whereas the App Store notes if an app has a watchOS/iMessage companion or has been enhanced to work with 3D Touch, Hey Siri, and Apple Pay, there is no similar designation for widget compatibility. And searching for “apps with widgets” does not return any relevant results. For now, the only way to find interesting or useful widgets is tied to already having that app installed. DataMan Next ($1) is a life-saver for iPhone users who don’t want to have to pay for data overages. In a glance, you can see whether you are in the safe zone or about to reach your data limit. Citymapper (free) is a super-reliable app for iPhone users who rely on public transit to get around. There are three companion widgets to choose from, whether its nearby transit lines or a giant “GO” button to get you to a saved destination from wherever you may be. Todoist (free) helps you tackle your to-do list, and this widget serves as a reminder of everything you need to accomplish for any given day. You can even mark things as done directly from the widget. Picniic (free) is for people whose to-do list revolves mainly around soccer practice and ballet recitals. This “family management” widget offers a daily snapshot so you don’t forget about that PTA meeting. REI (free) is known for having some killer sales on outdoor gear. The retailer’s widget shows you their “Deal of the Day,” with a photo of the product and the discounted price, so you can purchase it instantly on the app. What widgets can’t you live without? Let us know in the comments below.